Khirki Masjid is one of the few mosques in the country which is almost entirely covered. 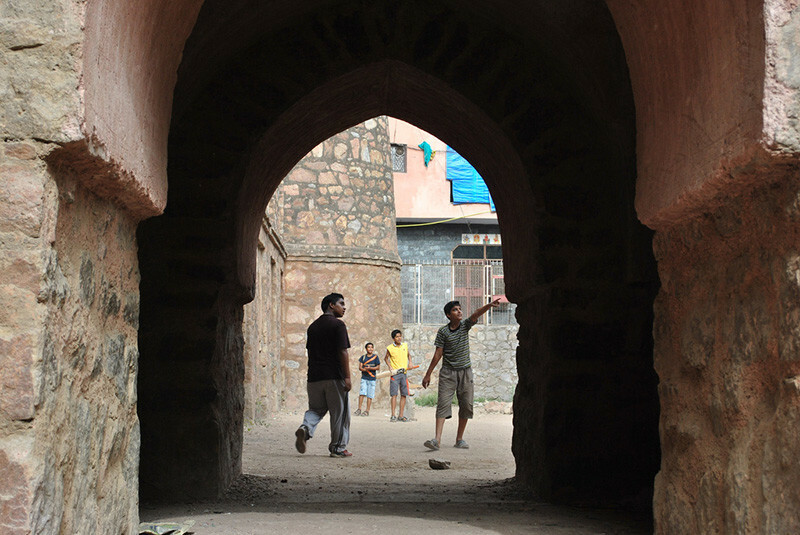 Erstwhile built as one of the mosques to stand in the ancient city of Jahanpanah (connecting Tughlaqabad & Siri), it lies close to the Satpula gates and was built by Firoz Shah Tughlaq’s Prime Minister, Khan-i-Jahan Junaan Telangani. Not only is the mosque built on a different beat than its counterparts of that era, but it also has a rare blend of Hindu & Islamic styles, built on a cross-axial platform with a tight geometry, almost like a mini fortress. Instead of one big open courtyard, the mosque has four smaller square courtyards measuring 30 feet x 30 feet. Due to modern day constructions popping up all around the structure, a few rays of sunlight filter in through the lattices on the upper floors. Another interesting aspect of this mosque is the design of its terrace. Partitioned into 25 squares of equal size, each square has 9 domes on each side, giving off very distinct shadows upon the interiors. One can take the eastern flank stairs to reach the roof and a visit is imperative to comprehend the mathematical, precise beauty of its design. 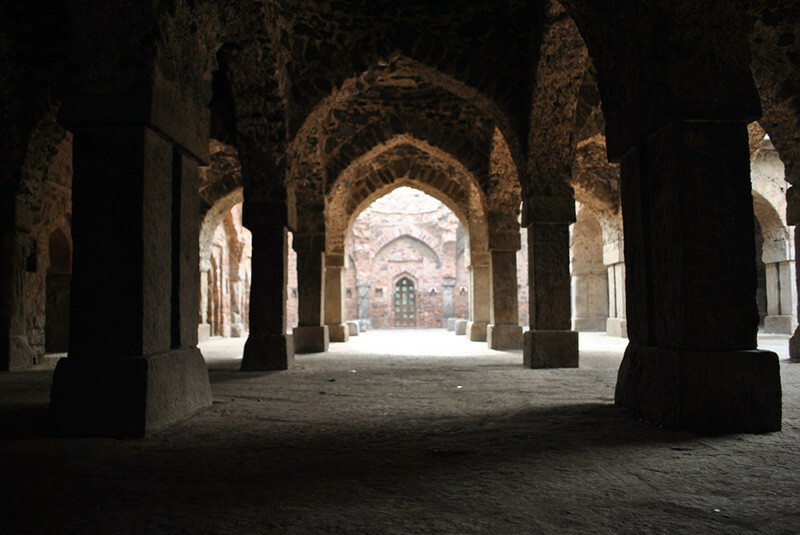 Khirki Masjid is one of the most complex & elegant constructions of the Tughlaq era, which was otherwise more attuned towards simple & rugged constructions. It is said to be a precursor to the Lodi & Mughal styles that were to evolve later on. Although there is minimal decoration both on the inside & outside, the geometrical intricacy of design is a marvel in itself. 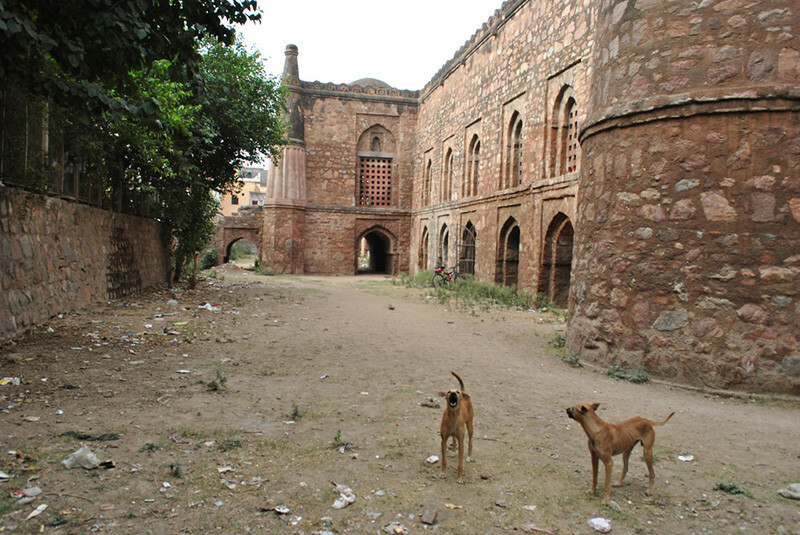 Many parts of the mosque have started crumbling, partly due to encroachment and the consequent lack of sunlight. The ASI tried its hand at some restoration work but using incorrect mixtures for making the lime mortar to save time has left its marks and stains. The space around the mosque has been badly encroached by modern day Khirki Village and entrance has to be gained from the opposite end of Select CITYWALK in Saket. There are kids seen using the limited green space for cricket, so don’t be perturbed if you catch a fielder posted in one of the turrets. The interiors are often badly encroached upon by miscreants, so the early & late hours of the day should be avoided. Saket Metro Station is the nearest station and a visit can be clubbed with the nearby monuments such as the Bijay Mandal, Begumpur Mosque & Satpula. So go explore this beautiful mosque of windows!